Hazrat Musleh Maud (may Allah be pleased with him) once explained that we should continuously self-reflect if our practice and decisions are in accordance with the Holy Qur’an and Hadith. And as to how should we proceed with matters if resolutions cannot be found in the Holy Qur’an or Hadith, he said we should adopt the sayings and practice of earlier Muslim religious scholars. The Promised Messiah (on whom be peace) was once asked about this and he answered that his way was to first and foremost follow the Holy Qur’an and if guidance for the particular issue cannot be found in the Qur’an then one should look in hadith and if it is also not found there, then the decision should be based on inference from what early scholars of Ummah had said. It should also be clear that the Promised Messiah (on whom be peace) had said that Sunnah takes precedence over Hadith. Sunnah of course is the practice of the Holy Prophet (peace and blessings of Allah be on him) which his Companions learnt from him and which in turn was learnt by the Tabi’un [Muslims born after the passing of Holy Prophet but who were contemporaries of the Companions] and then by the Tabi ul Tabi’un [generation of Muslims who came after the Tabi’un]. We should be mindful to only practice what God and His Prophet (peace and blessings of Allah be on him) allowed. Sometimes people are so obsessed with piety that they push themselves off limits. While majority of people take the commandments of God and the Holy Prophet on a cursory level. The stance of both kinds of people is taking things to extremes. There is an example of a woman who wanted to do something pious which was not warrantable and which is not allowed by God and His Prophet (peace and blessings of Allah be on him). Therein is a lesson for those who give too much importance to their dreams while not having the spiritual station where every dream of theirs can be true or can signify something. Hazrat Musleh Maud (may Allah be pleased with him) said that a woman who had mental health issues visited his household and said that she had seen the Promised Messiah in his dream who had told her that if she continuously fasted for six months Khalifatul Masih will regain his health. She said whichever scholar she had consulted had told her that such a practice was not right. Mian Bashir Ahmad Sahib advised her to fast on Mondays and Thursdays. She said she had another dream in which the Promised Messiah asked her why had she not started continuously fasting for six months! Hazart Musleh Maud’s (may Allah be pleased with him) response was that even the Promised Messiah (on whom be peace) had said that if any Divine revelation he received was ever going to be against the Holy Quran and Sunnah he would totally dismiss it. When it is clear from the teachings of the Holy Prophet (peace and blessings of Allah be on him) that continuous fasting is not allowed, then the woman’s dream was divergent. Anything divergent is satanic and not from God. Any dream that contradicts the Holy Qur’an and Sunnah cannot be a true dream. It is wrong and not pious to make one’s dream the basis of something and put oneself through unnecessary trouble and this can also be sinful. Indeed, people who are sent by God are not like ordinary people and God’s treatment with them is different. It should be clear to anyone who has any thoughts here that the Promised Messiah (on whom be peace) also fasted for six months that God was going to bestow prophethood on him. The Promised Messiah’s (on whom be peace) explained that he did not fast continuously off his own accord. He said he did so after receiving Divine revelations and being told to fast as he did. He said he had amazing spiritual experiences after fasting but he would not recommend everyone to follow suit. He said he did so after being told by God. Some criticise the Promised Messiah (on whom be peace) that by making a separate Jama’at he created a 73rd sect and caused friction rather than reduce discord. Matters such as thus regularly arise at the time of advent of Prophets of God. The Meccans used to allege that the Holy Prophet (peace and blessings of Allah be on him) had torn families and brothers apart although there was so much existing disorder at the time of his advent. The situation among Muslims is the same today. God sends His Prophets to remove disorder as those who accept him come into peace. No matter how unified our opponents [among Muslims] may be when it comes to opposing us, there is no love lost between them. And as long as they do not accept the Imam of the age this situation will continue whether they call us non-Muslims or not. According to the definition given by God and the Holy Prophet (peace and blessings of Allah be on him) we are true Muslims and no one can take this away from us. Hazrat Musleh Maud (may Allah be pleased with him) said that someone told him that a person from Ahl e Hadith was offering Salat with people of Hanafi creed in their mosque. When he raised his finger during tashahud posture they broke off their Salat and came down on him like a ton of bricks and started verbally abusing him. They did not even consider that they were in the middle of offering Salat. Thus, such disorder existed when the Promised Messiah (on whom be peace) came, what he did was reform it. Who creates disorder? One who injures someone or the doctor who treats the injury albeit his treatment may cause some hurt and pain. Who can say a doctor is cruel if he prescribes quinine to someone suffering from fever. Someone asked the Promised Messiah (on whom be peace) about creating discord and he answered that when we do not want milk to be curdled we keep it well out of the way of yoghurt because once milk comes in contact with yoghurt, it curdles. This is why it was essential for the community of the one sent by God to be separate from others who had lost their ways. Healthy people catch illness off the ailing if they are not careful. It is the way of God that the community of one sent by Him is kept separate from the spiritually ill. This is why the commandment is to have separate arrangements for funerals, marriages and Salat etc. The Promised Messiah (on whom be peace) was advising women at the time, so he said that his advice to women who are usually critical was that just as a healthy person’s life can be in danger when brought in contact with someone who has a disease it should be remembered that it is a similar condition when relationship is forged with a non-Ahmadi. Often women say that one cannot leave one’s brother or sister in this regard. Hazrat Musleh Maud (may Allah be pleased with him) said that in the event of an earthquake or a fire a sister would run for her life without any care for her brother. So why not have the same stance in matters of faith? This is because of lack of insight into faith and thus one is overwhelmed by feelings of comfort. If the angel of death was to visit a woman and say that the command was to take the life of her brother or another family member but he would take her life, no one would ever accept it. God states: ‘O ye who believe! save yourselves and your families from a Fire…’ (66:7) If a follower of the Promised Messiah (on whom be peace) was to be married to a non-Ahmadi, she would be distanced from Ahmadiyyat or would die in misery as she would be separated from her family. Can a woman throw her daughter in fire with her own hands? The practice of Ahmadis not marrying non-Ahmadis is not creating discord, it is self-protection and giving precedence to faith over worldly matters. Young men should also understand that if they call themselves Ahmadis and consider themselves as true Ahmadis they should not simply pursue personal wishes and marry Ahmadi girls and pay attention to faith over worldly wishes. The next generation is not only ruined by girls marrying outside Ahmadiyyat, it can also be the case when young men marry outside. Each Ahmadi should understand that one is not an Ahmadi merely due to societal pressure or because of relationships. One should be an Ahmadi owing to being mindful of faith. If Ahmadi young men keep on marrying girls from outside what of Ahmadi girls? If attention is not given Ahmadiyyat may not remain in families. Hazrat Khalifatul Masih said he often says to young men who marry outside that if they have married outside owing to some reason they should work on making a young man Ahmadi, make him a sincere Ahmadi and then arrange his match with an Ahmadi girl. This will give them an opportunity to do tabligh and also draw their attention to the significance of marrying Ahmadi girls. At the start of his Khilafat in 1914 Hazrat Musleh Maud (may Allah be pleased with him) said that he was aware that people of Jama’at had problems relating to marriages between Ahmadis and non-Ahmadis but [after Khilafat] he understood from letters how much difficulty people were experiencing. The Promised Messiah (on whom be peace) had recommended that a register be kept of names of young men and women who were of marriageable age on the suggestion of a person who had said that there was great difficulty in marriages of young men and women. He said that the Promised Messiah’s advice was not to foster relationships outside and people of the Jama’at were diverse, so what was to be done! Thus he suggested a register with names of Ahmadi young men and women which could be referred to every time someone asked for the Promised Messiah’s advice on marriage, because he said that no one in the Jama’at would not take the Promised Messiah’s advice. Some people make suggestions based on their personal interests and always end up in trouble because of this. It appears the intention of the person who made the suggestion was also not so good. Around the same time a very sincere Ahmadi approached the Promised Messiah (on whom be peace) for advice on marriage and the Promised Messiah referred him to a daughter of the person who had suggested making a register. However, he made an extremely illogical excuse and married his daughter to a non-Ahmadi. When the Promised Messiah (on whom be peace) came to know about this he said he was not going to get involved in marriage proposals again. Had this not been the case the Jama’at would not have faced the problems it does in this regard. One denial of what Prophet of God says can become a source of continuous trial for a community. People who marry their daughters outside soon realise the mistake. People still write acknowledging that they are suffering due to the decisions they made. Some girls are restricted from meeting their families and are also deprived of their faith. There are also parents who owing to egotistical tendencies do not agree on good Ahmadi marriage proposals although the young man and woman are happy. Hazrat Khalifatul Masih said at times people have not accepted his suggestions for marital matches. He added that if there were people who did not accept the Promised Messiah’s (on whom be peace) suggestions then by comparison people not accepting his suggestion was not so significant. However, such people do end up in horrific situations. Such a matter took place in Germany where parents did not let a girl get married where she wanted and murdered her and are now imprisoned. Parents should not be adamant when Ahmadi young men and women wish to get married by making huge issues of difference of caste and letting their egos get the better of them. Another matter which should be clear as regards marriage is that in Islam a girl’s choice as to where she gets married counts. The Holy Prophet (peace and blessings of Allah be on him) gave young women the right to choose. However, Islam also restricts that any nikah without the presence of a wali (guardian) of the girl is not valid. Hazrat Musleh Maud (may Allah be pleased with him) said that if God sent the Promised Messiah (on whom be peace) and if he truly was from God then apart from the exemptions that our Islamic Shariah itself makes, no nikah is valid without a wali. It is our duty to explain these matters to people and if they do not accept then we should sever ties with them. An incident happened in the lifetime of the Promised Messiah (on whom be peace). A girl wished to get married to someone to which her father did not agree. The girl went to another town and had her nikah officiated by some mullah and announced that she was married. The couple returned to Qadian but the Promised Messiah (on whom be peace) had them expelled from Qadian because they had their nikah performed against Shariah. Hazrat Musleh Maud (may Allah be pleased with him) said he was also encountered a situation where a mother wanted to get her son married to a girl without the presence of a wali. She felt as long as the girl was happy why a wali’s agreement was needed. Hazrat Musleh Maud put it to her how she like would if one of her daughters or daughters of their daughters would go off with someone from outside! Neither parents should be unduly strict and not get girls married owing to false pride nor does Islam permit girls to go to courts or to a maulawi and have their nikah performed. If there are certain problems they can write to Khalifa of the time and he will make a good decision in accordance with the situation. God’s blessings are there when the principle of giving precedence to faith over worldly matters is kept in view. In one of his sermons Hazrat Musleh Maud (may Allah be pleased with him) said that in order to instil love of God it was important to ponder over different Divine attributes when engaged in remembrance of God. He said it was a common law of nature that even for worldly love one either needs to be close to one’s beloved or have a photograph. For example Islam says that one may look at the other party before getting married and where it is difficult to see each other a photograph may be sent. Hazrat Musleh Maud recalled that when it was time for his marriage he was quite young and a photograph of his would-be-bride was requested and it was after he liked the girl in the photograph that the marriage took place. He said how one can feel love without seeing! As regards love of God, if God came in front of you but you covered your eyes with your hand and then expect to love God. How can that be! In one of his Urdu poetic couplets the Promised Messiah (on whom be peace) says that if one is not able to see the Beloved, may be one could hear Him! Perhaps experience some traces of the beauty and grace of the Beloved. That is, if the Beloved cannot be beheld, at least one may hear His voice, experience some sign of His beauty. And what would be an illustration of God? He is Lord (Rabb), He is Most Gracious (Rahman), He is Ever Merciful (Raheem), He is the Master of the Day of Judgement (Malike Yaum e Deen), He is the Coverer of faults (Sattar) He is the Holy One (Quddus), He is the Bestower of Security (Momin), He is the Protector (Muhaimin), He is the Source of Peace (Salam), He is the Subduer (Jabbar) and He is the Most Supreme (Qahhar) and many other attributes. When one repeatedly brings these attributes to mind along with their meanings then any one of these Divine attribute becomes God’s hearing, another becomes His sight, another becomes His hand and another becomes His body and thus one has a complete picture of God. Keeping all these Divine attributes ever in mind gives one love of God. Hazrat Musleh Maud (may Allah be pleased with him) said that he had heard the Promised Messiah (on whom be peace) say it many times and hundreds of his companions would have also heard him say that owing to vulnerability of their nature some people cannot adopt any right way in spite of good intentions and good aims. The Promised Messiah (on whom be peace) used to say that a man asked his friend to find a suitable match for his daughter. The friend found him a match and said the young man was very decent. When the father asked for more information the friend said that the young man was good-natured. The father probed further but the friend said have I not old you he is a good-natured person? The father said he could not proceed with this match solely on the basis that the young man was good natured. If someone was to abduct his daughter the young man will do nothing and just be good-natured with no sense of honour for faith. Believers do have good intentions, but alongside being good-natured they should also possess sense of honour. Such good-natured people also end up participating in gatherings of people who indulge in undue criticism. Good-nature on its own is not everything. For example participation in such gatherings can mean losing one’s sense of honour. At the very least there should be enough sense of honour to leave such gatherings. And if such criticism is a regular feature then the administration of the Jama’at should be informed and the administration should in turn inform the Khalifa of the time so that any necessary steps may be taken. Hazrat Musleh Maud (may Allah be pleased with him) said that people used to call the Promised Messiah a sorcerer. 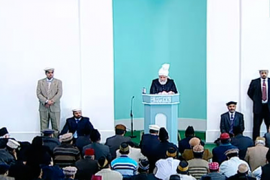 He says he remembers a friend telling him that he heard a maulawi making a speech urging people not to ever read the book of the Ahmadis and to never visit Qadian. He went on to tell a fictitious story which went like this: I once went to Qadian with a rich friend. We stayed at the guest house and expressed our wish to see Mirza Sahib. Maulawi Nur ud Din came and spoke to us very pleasantly. We were offered some halwa to eat and this is when I understood that some sorcery had been performed on the halwa. My companion ate it but as I was aware of everything I did not eat and slipped away on some excuse. Maulawi Nur ud Din Sahib did not realise that I had not eaten the halwa. A short while later my friend who had eaten the halwa said he felt very attracted to what he had heard and felt like taking Bai’at but as I had not eaten it, there was no effect on me. A short while later Mirza Sahib had his phaeton/carriage ready and sat in it with Maulawi Nur ud Din Sahib and also invited me to sit in it. Mirza Sahib started talking to me and I just kept nodding my head. He thought I had eaten the halwa and would accept him. Mirza Sahib said he was a Prophet, he then said, God forbid, that he was greater than the Holy Prophet and then said God forbid, he was god. When I refuted him he asked Maulawi Nur ud Din Sahib had he not offered me halwa to eat. He replied that the halwa was offered but seemed that it had no effect. Sometimes it so happens that the falsehood of these people is uncovered on the spot. In the same gathering a non-Ahmadi lawyer was present who had gone to Qadian to see Hazrat Khalifatul Maish I (may Allah be pleased with him) for treatment. He said that he already felt very negative about maulawis and thought they were liars but now he felt there were no bigger liars than them. He said he was not an Ahmadi but he had been to Qadian for treatment and whatever the maulawi had said was untrue. He added let alone phaetons, there were not even humble horse drawn curricles in Qadian! It just so happened that at the time when Hazrat Musleh Maud wrote this which was years later, there were still no phaetons in Qadian. Hazrat Musleh Maud (may Allah be pleased with him) said people still thought sorcery was performed in Qadian when they saw people who accepted Ahmadiyyat stay firm and resolved in their faith in spite of facing severe persecution. People attribute this fearless resolve to sorcery. Next two funeral Prayers were announced. A present funeral for Sakina Naheed Sahiba who passed away on 3 April at the age of 90. Funeral Prayer in absentia was announced for Shaukat Ghani Shaheed who gave his life in action on 3 April. He was a soldier in Pakistan army and was in the Gwador area in Baluchistan taking part in a military operation. He gave his life as a result of terrorists opening sudden fire. He was 21 years old and was buried in Rabwah with full military honour. He was a moosi.